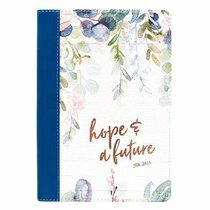 Knowing that the Lord has plans to give you hope and a future, as wonderfully described in Jeremiah 29:11, is the essence behind the Hope And A Future LuxLeather Journal. This Christian journal makes a sweet gift for a special woman in your life who could use some time away from the busyness of everyday life to pen her thoughts. About "Thinline Journal: Hope & Future, Green Branches (Jer 29:11)"